Canada’s Wynn Audio sure mixed it up, to good effect, in a system that included two premieres: Crystal Cable’s Future Dream 15th Anniversary limited-edition series, which combines proprietary monocrystal silver and silver-gold alloy in a four-coaxial-conductor construction insulated by Dupont Kapton and Teflon, and the Entreq Silver Tellus Infinity ground box ($2400 each), a passive device that, using a different technology to Nordost’s QKore grounding units, claims to remove ground noise from components. Amidst umpteen systems that ran aground in the bass department, this setup excelled in its strong, well-delineated bass foundation. The top, too, was excellent. “Why I Sing the Blues” from Lee Ritenour’s 6-String Theory sounded excellent, with the top presented truthfully but without excessive brightness. “Wade in the Water” on someone or other’s recording was equally distinguished for its nice top and lovely midrange. 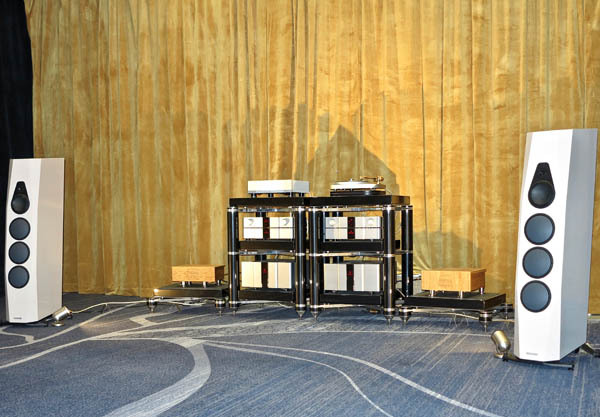 The rest of the system included a Thales TTT-Compact Mk2 turntable ($14,850) with Thales Statement tonearm ($21,090) and EMT JSD-VM cartridge ($4,995); Karan Acoustics L Reference phono preamp ($23,995) and M 2000 monoblocks ($59,999/pair); Vimberg Tonda speakers ($38,000/pair); Metronome AQWO SACD/CD Player ($18,000); and Critical Mass Systems Olympus racks and amp stands.